From Marmit! 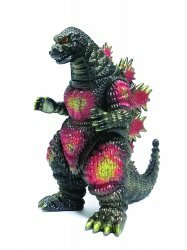 Based on his appearance in the 1995 Godzilla monster, the mighty monster is recreated in soft vinyl for this sofubi figure! Only 2 left almost sold out! The hand-painted figure measures about 9-inches tall. 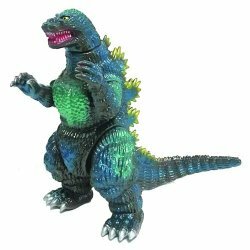 Add to your Godzilla collection with the Godzilla 1995 Sofubi Monster Heaven Vinyl Figure! Collector's Note: Stock photo of figure out of box was supplied by Diamond Comic Distributors. The color scheme of the actual figure itself more accurately matches the color scheme of the figure shown on the box. Soft brown cardboard boxes are not intended as collectibles and may have dings and dents not affecting the figure. If the condition of the brown box is important to you, please contact us before ordering and we will select the best one available to ship.